Very prolific, clear skinned, green when ripe cherries are just as tasty as Aunt Ruby's German Green and are a nice size at about 2 plus ounces. Indeterminate. Regular Leaf. 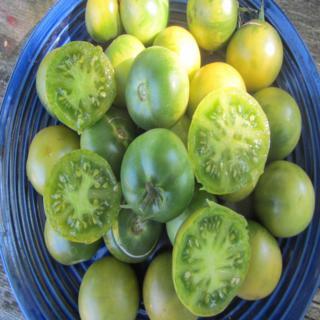 Very prolific, clear skinned, green when ripe cherries are just as tasty as Aunt Ruby's German Green and are a nice size at about 2 plus ounces. Blush pink when ripe and we agreed here that they taste better if they are picked a bit early.